A major cause of aging is deterioration of the energy-producing components of the cell, resulting in reduced cellular metabolic activity, the accumulation of cellular debris and eventually cell death. 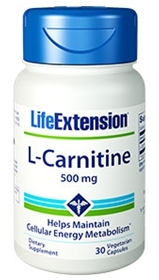 L-carnitine helps maintain cellular energy metabolism by assisting in the transport of fat through the cell membrane and into the mitochondria within the cell, where fats are oxidized to produce the cellular energy ATP. Other ingredients: gelatin, vegetable stearate, silica.